On July 27, John Mozeliak revamped the bullpen. Gone were Greg Holland and Tyler Lyons (though thankfully the Patron Pitcher of the Blog cleared waivers and returned to Memphis) and Brett Cecil was put on the disabled list. Removing the disappointing veterans and bringing up young talent such as Dakota Hudson and Daniel Poncedeleon was the biggest impact move of the year, at least in regards to players. Since that shakeup, the Cardinals have played 12 games and while they are 8-4 in those games, which is a telling note in and of itself, that’s not what I wanted to mention. Out of those four losses, none of them were by greater than three runs. One of those, the Colorado game that they lost 6-3, still had them rallying to put a couple of runs on the board and a chance to do more. They have not been out of a game by the late innings in quite some time, which is a refreshing change. In part, it is because the offense doesn’t have those ridiculous dead zones that they’ve had before (though this series in Miami might challenge that idea) but it’s also because we don’t see games get away late with this new bullpen. You do wonder how the season would have gone had some changes been made earlier. That’s something for this offseason, though. Right now, we have a couple of games from Florida to discuss. Hero: Luke Weaver. On a night when the bats just couldn’t break through, a shaky Weaver could have made this ugly quickly. Instead, he went six innings and allowed just two runs, his third straight outing where he’s allowed just two to dent the plate. (Of course, the middle start of that streak was a game he left in the third.) He’s got a 3.31 ERA since the beginning of July and it feels like Mike Shildt knows not to ride him too hard if he’s shaky. He’s got two six inning starts since the managerial change but he’s also that 2.2 outing as well as a four inning one. Which is, as we keep saying because there’s so much of it, what you kinda expect from young pitching. Weaver (and Tyler Webb, who pitched two scoreless frames in relief) allowed the ninth inning to be decisive. Goat: Yadier Molina. Not only did Molina not get a hit in this one, he came up with the bases loaded and only one out in the ninth. A fly ball probably ties the game. A base hit might have won it. 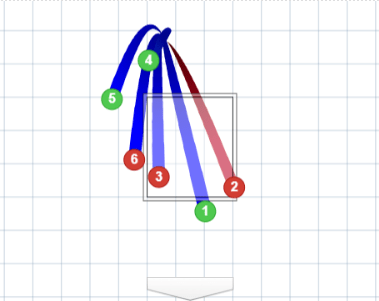 It is fair to note that erratic reliever Kyle Barraclough, who had been walking everyone including Matt Carpenter to force in a run, was removed before Molina’s at bat and Javy Guerra was brought in. Still, the one thing that Molina can’t do there is hit into a double play, and that’s the one thing he did. Notes: It’s hard not to talk about the ninth without talking about Kolten Wong‘s at bat. Paul DeJong and Harrison Bader had singled off of Barraclough to start the frame and Yairo Munoz had walked on four pitches. Wong came up and got down 1-2 before working his way up to a full count, in part because Barraclough wasn’t even that close. Here’s what the GameDay representation looks like for the at bat, including the last pitch. As you can see, the last pitch seems to be a full ball off the plate. Kolten Wong sure thought so, which is why he didn’t swing at it. The home plate umpire saw it differently and rang up Wong. Games usually don’t have such an obvious fulcrum, but it could have been (and basically was, when you think about it) that the Cards could have gone from bases-loaded nobody out to out of the inning because of that call and a double play. It was surprising, given that Barraclough hadn’t show much command in this inning, that he was able to get the generous call. There is the argument that Wong should have protected the plate, but there’s also an argument that Wong should not be punished for knowing the strike zone better than the umpire. If you think a pitch is a ball, especially in this situation where a walk brings in a run, you are rarely going to try to swing at it. It would have been nice if things would have worked out so that the Cardinals could have had, I don’t know, two or three runs before that, however. Wei-Yin Chen is apparently very tough at home and he kept that up here, allowing nothing in just under six innings. Jedd Gyorko and Harrison Bader had a couple of well-hit drives that just sort of died in the deepest part of the park and having the roof open may not have been helpful either. Marcell Ozuna enjoyed his return to Miami by getting three hits, but like so often has been the case this season, all of them were singles. Bader had two hits and Carpenter had a hit plus his bases-loaded walk. Hero: Paul DeJong. While Matt Carpenter had the deciding blow, DeJong is the one that made it possible. With the Cardinals trailing 2-0 in the seventh, Jedd Gyorko drew a two-out walk. DeJong had hit just one home run since returning from his thumb injury, but he took a 0-1 pitch on a line to left, tying up the game. Once that happened, it felt almost inevitable that the Redbirds would pull out a victory, a far cry from what it felt just an inning before. Goat: Tough night for Harrison Bader. A number of hitters went 0-fer but not only did Bader go hitless in four at bats, he left three men on base, including popping out to shortstop when DeJong was at third with one out in the fifth. He did make a stellar defensive play in the bottom of the eighth that helped keep the Marlins off the basepaths in a one-run game, so it wasn’t a complete waste of an evening for the young outfielder. Notes: It’s gotta be the salsa. Carpenter hit his 30th home run of the season to break the tie in the eighth and, with the help of Dakota Hudson and Bud Norris, send the Cards home a winner. It’s the fastest any Cardinal has been to 30 homers since Albert Pujols–though, as we’ve noted in the Marking McGwire series, there’s not been a lot of SEASONS of 30 homers since Albert–and he leads the NL in the category as well as many, many others. As your regular reminder, since his low point in mid-May, Carpenter has a .339/.438/.725 line for a 1.163 OPS. 27 homers in 74 games. That’s a 59 HR pace for a full season, which is just crazy. Miles Mikolas didn’t get a lot of support until the end, but he still picked up his 12th win by going seven innings and allowing just the two runs on five hits. While Mikolas has gone above and beyond anything we reasonably thought, the one thing some of us did think was that he would eat innings, judging by how deep he went into games in Japan. He’s averaging about 6.1 innings a start and has gone at least seven eight times including his last two. With all the young arms and the innings crunch that seems to be coming, having a stable presence like Mikolas is really big. Yadier Molina went hitless for the second straight night, which is very unYadi-like as we’ve noted a few times this season. That probably means he’s due for a couple of knocks tonight, though with the day off tomorrow there’s the general idea that, with a normal catcher, you could give him the night off and get him two days of rest in a row. As we know, Molina is no normal catcher. Francisco Pena has caught an inning this month, the eighth in the first game against Pittsburgh, and hasn’t started a game since July 8, save the second game of the doubleheader against the Cubs. (Asking Yadi to go back to back games in the same day is a little much, though he did catch all of that 20-inning game a decade ago. I guess age gets to us all.) I don’t expect we’ll see Pena’s name tonight. Ozuna had another couple of hits–again, just singles–and that was about it for the offense. Still, a team that has scored a total of four runs has split the first two games of a series and can get their fourth straight series win tonight with John Gant going against Trevor Richards. Hopefully we’ll also see the debut of Adolis Garcia. It’s been strange not to see him get at least a pinch-hit appearance over the first couple of days. If this was the former manager, we’d be seeing this as another example of him not understanding how to use players. With Shildt, I’m assuming he’s got a reason for it and I just haven’t heard it yet. There’s no doubt the new guy has a bit more good will to play with here, but keeping him out of games for too long makes you wonder why they brought him up. We’ll see tonight!